Each destination tells the story of a local church or chapel in new and inspiring ways. Learn about the lives of local people, past and present. Enjoy the natural beauty of the landscape and its wildlife. Step off the beaten track, take an adventure from the coast to the hills and uncover beautiful sights, sounds and stories along the way. Peaceful Places offers 14 inspiring destinations for you to explore - each with its own fascinating stories, stunning scenery and mysteries to uncover. 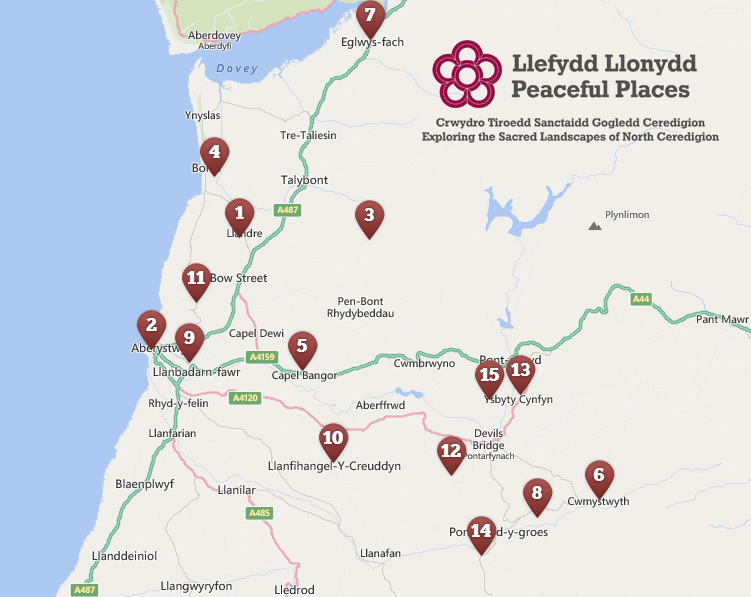 Choose a place to visit by browsing the map and the link will take you to the relevant page on the Peaceful Places website. Peaceful Places is a heritage tourism trail, which tells the stories of a collection of churches and chapels across North Ceredigion. Journey through the landscape to discover spectacular wildlife and natural beauty, family history and tales of human events and achievements, embellished with architecture, art and craftsmanship. Peaceful Places is not a faith trail in the traditional sense. Its purpose is to celebrate the heritage of each church and chapel in ways that are relevant to everyone, irrespective of religious beliefs. It encourages visitors to experience churches and chapels from new perspectives - as places of inspiration and meditation; as opportunities to “do something different” and enjoy a change of pace; as destinations where “quality time” can be spent amidst the beauty and tranquillity of the landscape. Peaceful Places is a product of the North Ceredigion Churches Heritage Trail project, supported by Cadw(the Welsh Government’s historic environment service) using investment from the European Regional Development Fund (ERDF). The project is managed by Treftadaeth Llandre Heritage; work is being undertaken by consultants Countryscape and Creu-ad. The project has been developed in partnership with local communities at each of the destinations on the trail, without whose involvement none of this would have been possible. We’d like to take this opportunity to say a big thank you to everyone who’s accompanied us on this journey – your passion and enthusiasm has been truly inspirational!